Today’s post is all about the opposite of a TO DO list – the DONE list – and why it is arguably more important and better for you than your TO DO list. On the other hand, a DONE list can be a fantastic tool for motivation and productivity, a way to track your progress and give yourself a pat on the back at jobs done. I know which I would prefer to look at at the end of each day – how about you? I get quite a few emails each week of a similar nature. That is that people struggle with feeling like they are getting anywhere when organising their homes and lives. It seems far too large a task to ever complete, and the never ending nature of it can be totally overwhelming. When you feel like this it’s all too easy to give up – and that is where the issue comes. People tend to focus naturally on what they haven’t done rather than what they have done. We focus on the negative (things that need doing) rather than the positive (things that we have achieved) all too much in this world – and sometimes it’s good to take a break and switch things round a little. Yes, we do need to track what we need TO DO – I would be crazy to suggest otherwise, but I am also all for giving yourself a pat on the back when you have done something good – as it’s all too easy to let these things go by and only focus on what you haven’t done. This can be especially true when you are trying to organise and sort your home and life out – it seems like a massive uphill struggle that’s never ending. So, today it’s time to give yourself a break and create yourself a DONE list. A DONE list is a list that simply tracks what you have already achieved – nothing more and nothing less. When you write your TO DO list and get something done on it, I have always said to highlight rather than cross out – as highlighting tasks makes more of a statement that they are done rather than crossing them out (which to me always feels like you are forgetting about them). The DONE list is simply the next step to this thinking. It’s a place to write down all these highlighted tasks – and is the place to look back and see how far you have actually come. Sometimes simply tracking what you do over the course of the day/week/month/year, and recognising every task you do, can help to motivate you, puts your day into perspective, and keeps you on track for planning the following day(s). You see, however small tasks are, they add up slowly to create a larger amount of work that’s been completed – so you may feel like you haven’t got anywhere, but actually when you look back over your list you will have got a few things done at least. It’s very similar to creating a food diary when you are trying to lose weight. If you write everything that you eat each day down then you become more aware of what you are eating and you can react to the facts (eat more or eat less) – and once you start to write down all the tasks you have done, then you tend to generally see that you are doing more than you think, and you are progressing towards your goal – and as a result you feel more motivated and empowered to continue. I for one am all for that feeling! Why not start to be your own cheerleader – starting today simply write down all the stuff you do each day in a list at the back of your diary. Date each task so you see what you do daily – and don’t forget to write everything down – the little things all count too. When you look back over time, or when you are feeling like you aren’t getting anywhere, that’s the time to take a look at your DONE list and give yourself that all important boost. Don’t forget as well to reward yourself for getting as far as you have. Even the largest of tasks (such as organising your entire home) needs to be achieved by lots of smaller tasks – so you can get one step further towards it each day. Seeing things written down will help you to realise how much you have actually done, give you motivation to continue, and probably make you more productive in the long run as you will find more focus and drive – so why not get started today!. Are you going to start your own DONE list? Have you already got one? I’d love to know so please leave a comment below – thanks in advance! This is such a clever idea! 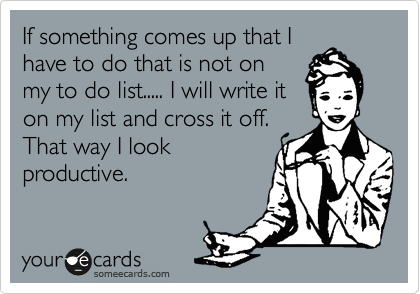 When I think about it, there are so many things I do that don’t ever make it onto my to do list. So it probably would make me feel I have achieved more if I focused on what I have done rather than what I haven’t. Glad you like it Helen – we are always a little too busy to give ourselves a break sometimes so a little pat on the back from a DONE list can work wonders!